I am exhausted. I returned home after performing at tea parties in 42 cities from Searchlight, NV to Washington DC in 19 days while on Tea Party Express III tour. 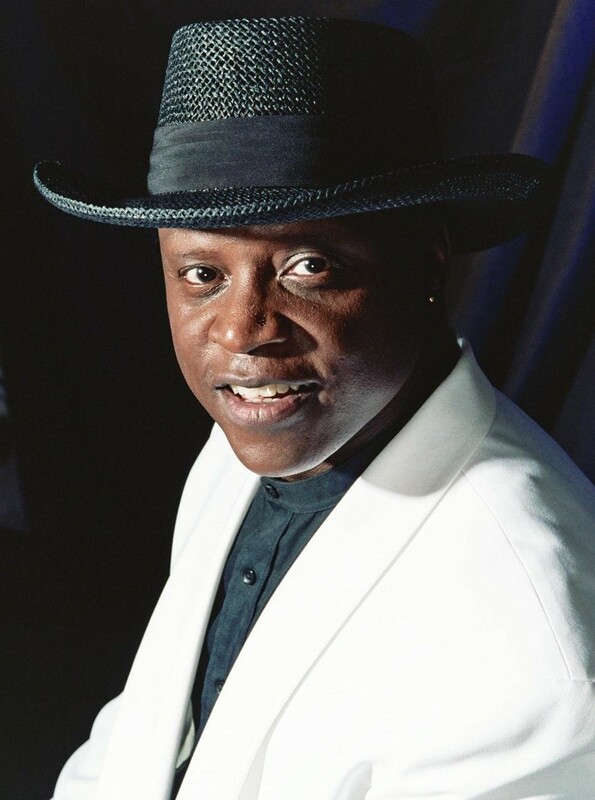 I'm black conservative singer/songwriter, entertainer, author and spokesperson Lloyd Marcus. I wish to share with you how the liberal mainstream media has dealt with my participation on the Tea Party Express III tour. Liberal mainstream media all but call me an Uncle Tom. Their reports imply that I am a token black too stupid to realize I am being used by the tea party movement. In typical liberal mainstream media arrogance, they are totally blind to the blatant racism of their reporting. Because I do not fit the liberal mainstream media's "all blacks must vote Democrat and believe America is racist and unjust" template, I must be an idiot. As a matter of fact, because I am a black man who loves his country and proclaims America is the greatest land of opportunity on the planet for all who choose to go for it, much of liberal media considers me dangerous and even wishes me harm. The liberal mainstream media is relentless in their quest to portray the tea party patriots as racist. And yet, I have performed my song, "American Tea Party Anthem" at over 150 tea parties, been treated like a rock star and have even seen signs which read, "Lloyd Marcus for President!" Not one tea party attendee has ever called me the N-word. Meanwhile, a Google search will reveal numerous liberal websites and blogs which freely and excessively call me an f-ing stupid N-word. The reason for their over-the-top anger and outrage against me, I express love for my country and refuse to be a hyphenated American. The same liberals who accuse white conservative Republicans of being mean-spirited, racist and intolerant are the hate-filled black and white Democrats who use the N-word every other word when writing about me and have even threaten me with physical harm. After my performance at a tea party in Traverse City, Michigan, a white reporter approached me for an interview. The mostly white upbeat audience loved me and my patriotic performance. Smiles were everywhere. With a stone face, the snooty female reporter asked me a series of annoying questions straight out of the liberal play book. But, what really got my blood boiling was when she asked me the following question with the trademark liberal condescending edge, "Mr. Marcus don't you think by calling yourself an unhyphenated American you are encouraging white people to feel comfortable with their racism?" I wanted to say, "Lady, what the heck are you talking about? You are obviously one miserable, bitter and unhappy human being. Get away from me." Instead, I replied, "With all due respect, I strongly disagree." I turned and walked away from her abruptly ending the interview. Perhaps, I should have stayed and argued my point of view with her. But, I have lost patience with arrogant liberal reporters who think they are so much smarter than us. This negative-spirited reporter had decided the spin of her story before interviewing me. My answers to her questions would not have made a difference. At our Tea Party Express III tour rally in Buffalo NY. four TV channels covering the rally had cameras in front of the stage. In the finale of each rally, we sing "God Bless The USA". Emotions were high in Buffalo as the audience waved U.S. flags, sang along, and many wept. All four camera techs had looks on their faces as if they were vampires who had just been shown a cross. They were not happy campers. What is with these folks in the media? Why such disdain for their country? 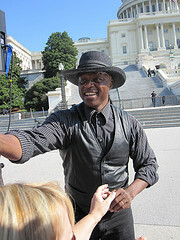 At the April 15th Tea Party in Washington DC, A reporter for Ebony, a prominent national black magazine approached me for an interview after my performance. The reporter asked me the same two questions every other reporter has asked. Are the tea parties racist? Why are blacks not attending? Without going into great detail in this article, I explained to the reporter the tea party movement is not about race, but about stopping an out of control administration from pushing our country towards socialism. Frustratingly, the Ebony magazine reporter replied, "So, why do you hate Barack Obama?" Then, outrageously his asked me again, "Are these rallies racist?" It was as if he did not hear a word I said. The liberal mainstream media obviously has an agenda and a paradigm to maintain. They say the tea party movement is racist and the facts will not change their reporting. 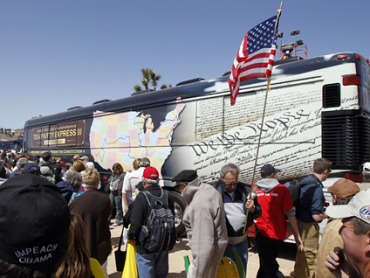 At the Traverse City, Michigan rally on the Tea Party Express III tour, a white woman approached me in a wheelchair. Extremely excited she said, "Oh my gosh, it's Lloyd Marcus. May I have a picture with you? Thank you so much for all you are doing for our country. I love you!" After a picture and hugs, I chatted with other fans. Later with tears in his eyes, Don, a Tea Party Express staff member told me more about the woman in the wheelchair. The woman's daughter told Don her mom was dying. The daughter said her mom told her, "All she wanted to do before dying was to meet Lloyd Marcus." Wow! I was blown away and humbled. Then, I became extremely angry at the liberal mainstream media's and Democrats' viscous shameful attempts to portray the tea party patriots as racist. Just the other day, after my performance at a tea party in St Augustine, FL, an elderly white veteran thanked me and broke down in tears for our country. We embraced for several moments. The liberal mainstream media and democrats are attempting to racially divide and conquer our country. They are evil. As long as God gives me strength I will continue to defend my fellow patriots who are white and fight to take back America.